We often take lighting for granted but it becomes even more critical for workers in exposed and hazardous locations. Lamps and fittings must be dependable, durable, cost effective and with a long life span. indEx can offer an exclusive range of the highest quality lighting possible, with a full range of solutions and accessories. 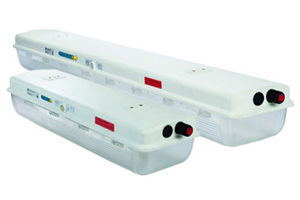 For emergency Ex e lighting we use extruded GRP casings. The transparent parts are manufactured from UV-resistant polycarbonate. The disconnect switch is actuated by the latch and the electronic ballast, isolation switch, lamp holders and terminals are EX rated and mounted inside an EX light fitting. These can be hung on ceilings with chains, brackets or clamps and are generally used in heavy industrial areas as well as hazardous areas.